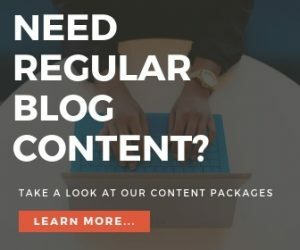 This SEO copywriting checklist provides an introduction to some of the SEO copywriting techniques I use to increase traffic to my clients’ websites. If you’re looking to improve your website in search engine rankings, then this checklist will give you a great starting point. 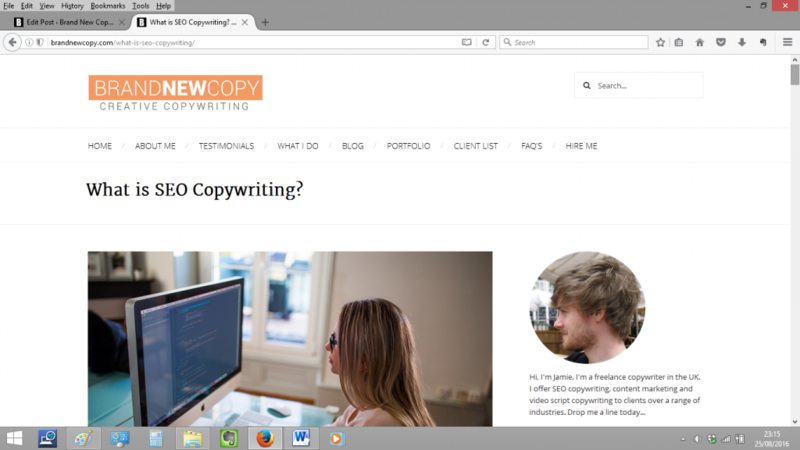 We’ve covered this topic in greater depth in this post, but in a nutshell, SEO copywriting is the practice (some might say art) of making a web page ‘crawlable’ to search engines with the aim of improving its presence in search rankings. Whereas off-page SEO focuses on creating backlinks to a website, it’s often claimed by SEO copywriters like myself, that valuable content and proper on-page SEO can attract backlinks naturally, without the need for additional outreach. In an ideal world however, both practices would be followed to maximise results. 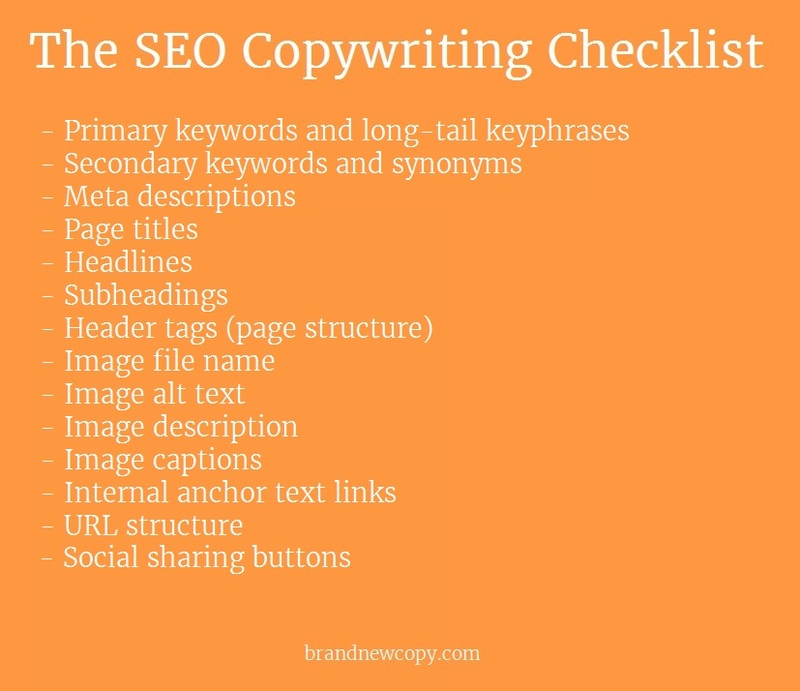 This checklist provides an overview, with examples, of the SEO copywriting best practices that make websites more search engine friendly. They can be applied to various different content types, including blog posts, web pages and press releases . Good, quality copy comes first. Personally, I recommend writing your copy first, and then adding the SEO elements afterwards to ensure that your pages satisfy your reader first and search engines second. Before we begin optimizing a web page or blog, the first thing we need to think about is what we’re going to write about. From an SEO perspective, it’s important to know whether or not the topic you plan to write about is a popular search term. I recommend using a combination of Google Adword’s Keyword Planner and a paid version of SEMRush to generate content ideas based on what people in your niche are searching for and what your competitors have already written about. It’s often said that the ideal length of a blog post is 1,600 words and takes 7 minutes to read. Although this doesn’t need to be a hard and fast rule, longer content does tend to rank better than shorter posts. Written content should be split up using subheadings and bullet points and where possible, should contain captioned images, graphics or videos throughout the body to help explain the points in the text. For more information about the importance of focusing on content before SEO, have a read of my post on Why Content is the Most Important Part of your Website. 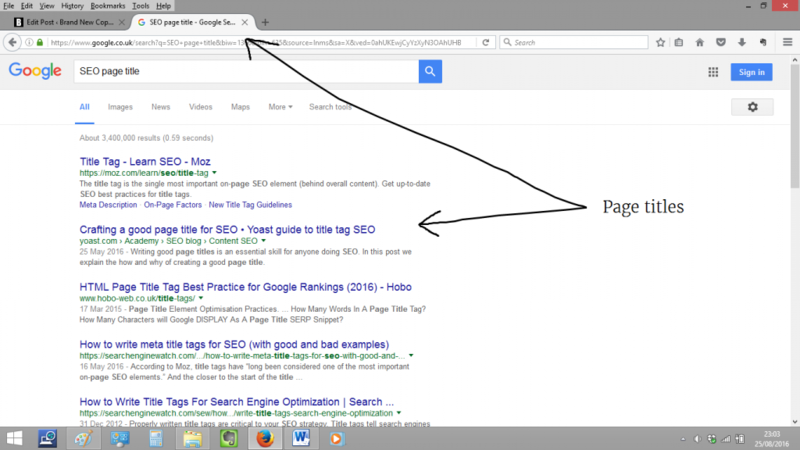 On-page SEO is undeniably useful for improving website rankings. It accounts for approximately 15% of all of Google’s 200 ranking factors and when coupled with careful internal linking and great content, it can improve a website’s search rankings considerably. The big mistake that people tend to make with SEO copywriting is thinking that a post or web page must contain every single SEO element. In reality, this is rarely possible as some content management systems (particularly those that are custom-built) restrict what on-page elements can be implemented. So if you can’t fit every single element on the checklist below into your posts, don’t worry, you’re not expected to. Remember, on-page SEO is only a part of the larger SEO equation, so don’t focus all of your efforts on on-page alone. A primary keyword is the main word that you want your content to rank for. It’s important to keep your target keyword in mind when writing page headlines and page titles. Although it can help to use the keyword frequently throughout a piece of content, don’t try and shoehorn it in. Remember, keywords should be used naturally. Low competition keywords are fairly easy to target but those that are mid and high competition are more difficult. 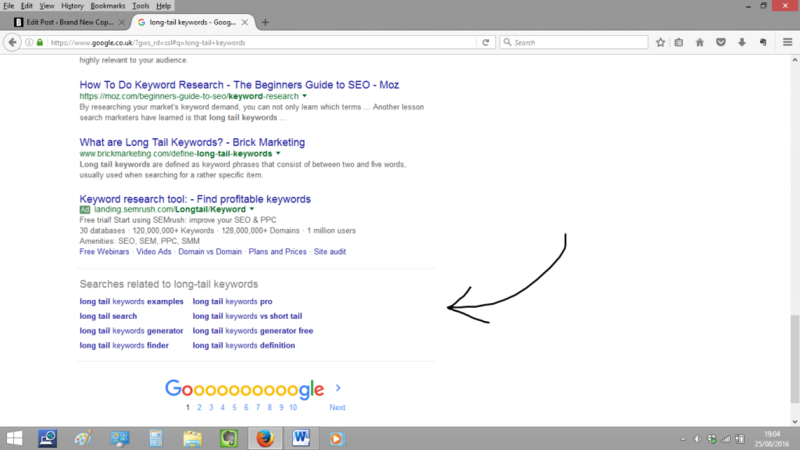 Long-tail keywords, however can be easier to target as they’re generally searched for less frequently. One way of identifying relevant long-tail keywords is to look at the ‘related searches’ section at the bottom of a search page. Similarly, Google’s auto-complete function can help you find frequently asked questions related to your primary search term, which can form the basis of a long-tail target. Secondary keywords are words that relate to your primary target but stand independently on their own. For example, a secondary key term of the phrase ‘why should I study Maths?’ might be ‘should I study Maths?’ or ‘studying Maths’. A synonym on the other hand, is a word that closely relates to another. For example, synonyms of the phrase ‘why should I study Maths?’ might be ‘should I study Maths?’ or ‘studying Maths’. 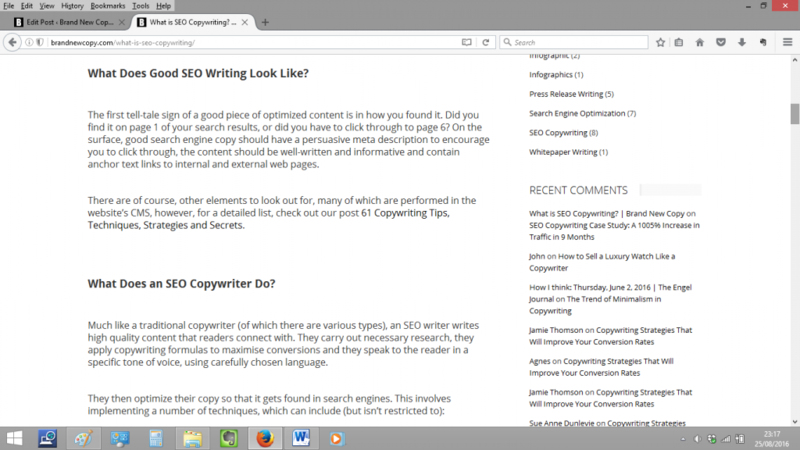 Secondary keywords and synonyms can help your content rank for additional keywords related to your topic. They can also be used as alternative phrases to your primary target, so you don’t end up keyword stuffing the same phrase over and over again. Meta descriptions are the snippets of text that appear underneath a website page title in search results. If you’re optimizing your content for desktop devices, they should be a maximum of 160 characters in length (with spaces) and if you’re optimizing for mobile, you should be aiming for around 120 characters (with spaces). There are exceptions to the rule however, as Dr. Peter J. Meyers points out in this post on the Moz blog. The general consensus about keywords in meta descriptions are that they’re not as important as they once were. Click-through-rates (CTR), however are important as they provide Google with a good indication of how relevant a website is to a user’s search query. In any case, you should always aim to encourage people to click through to your website by using persuasive language in your descriptions. 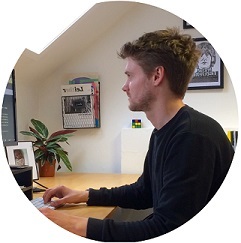 Top tip: When looking to improve conversion rates of meta descriptions, look to AdWords campaigns for inspiration. Start by doing a Google search for the page title that you want to write a meta description for, then rather than looking at the organic results, have a look at the paid AdWords results. Companies choose the text that they do in their AdWords campaigns for one reason – it converts. In a lot of cases, the text that they settle on has been tested against other combinations and the combination that you see is often the one that produces the best results. 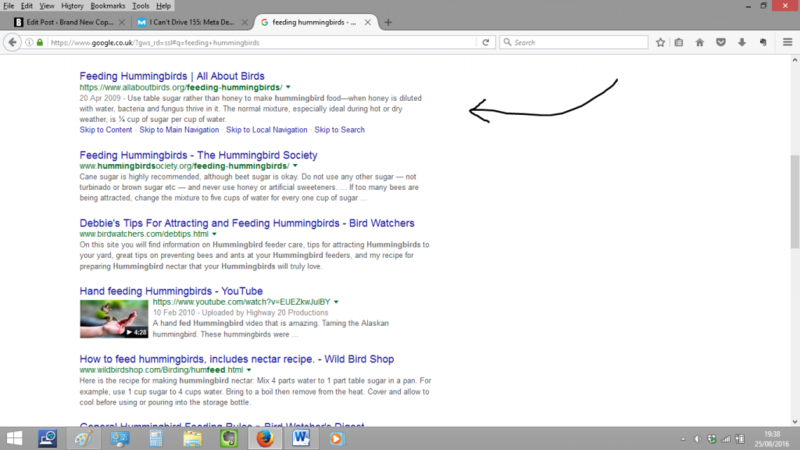 A page title is the text that appears in the browser tab of a website. It plays an important role in directing Google to your content. You should also aim to place your most relevant keywords towards the beginning of a page title to reinforce its authority. The headline of a page appears at the top of a piece of content. Ideally, a headline should be based on popular search terms relating to the topic you’re writing about and ideally contain primary or secondary keyphrases. However, keyword-rich headlines shouldn’t take precedence over a clever or intriguing title that sparks people’s curiosity and encourages them to read on. Subheadings should be used to separate the body copy and introduce the next point in the content. They can contain relevant keywords but shouldn’t be forced if it’s unnecessary. 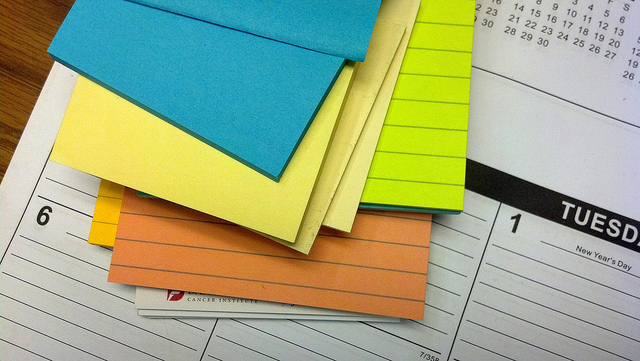 Subheadings should add to the flow of content, not disrupt it. When using a WYSIWYG editor, header tags are automatically added when you choose the ‘header format’ options. They’re used to give emphasis to certain parts of your copy and are typically used to format headlines and subheadings. They direct Google to important parts of your content. The practice of applying header tags to your copy is known as setting ‘page architecture’. It’s important that you name your image files appropriately. For example, an image of a sunset should be named sunset.jpg, rather than a series of numbers like IMG_0485.jpg or anything else that doesn’t correspond to the image itself. Whereas humans can see images, interpret them and understand their context, search engines need more guidance. Google understands images by reading the alternative text that you provide. Whenever an image doesn’t display properly on your website, its alt text is shown instead, which also helps provide context to humans. The text should describe what is happening in the image. Adding descriptions to your images adds words to the page content and so provides you with a great opportunity to work in some relevant keywords to help your rankings. Similarly, when a visitor carries out an image search in Google and selects a particular visual, it’s the description that is used to determine its relevancy. An oft-missed opportunity, image captions provide context to visual content and give you the chance to include some relevant keywords alongside your images. People tend to scan images on a web page before they read the content, and therefore their eyes are naturally drawn to image captions before any other text. It’s important to put some thought into your captions as they can often be the determining factor in whether people read your content in full or not. Directing anchor text links from one web page to another helps Google crawl your website. The key to successful internal linking is to avoid linking to your homepage (the most commonly linked to page on a website) and to use long-tail keyphrases that relate to the page you’re linking to. It’s important that a page has a variation of keyphrases linking to it rather than just the same keyword used several times. as Google wants internal links to appear as natural as possible. Although repetitive internal keyword linking isn’t as dangerous as repetitive external keyword linking, it should still be avoided. Personally, I wouldn’t try to rewrite content just for the sake of anchoring a keyphrase, you can still create an internal link using a phrase that loosely relates to the page you’re linking to. Google hasn’t published any specific guidance on how many internal links you should have in a blog post. However, back in 2009, Matt Cutts (head of Google webspam) did say that you should keep internal links to a ‘reasonable number’ and ideally, less than one hundred. However, this is per page, not per blog post. Every website template has navigation links in their main menu, footer and sidebar and these appear on every page of your site. So, at any given time, every page on your website will already have a certain number of links. 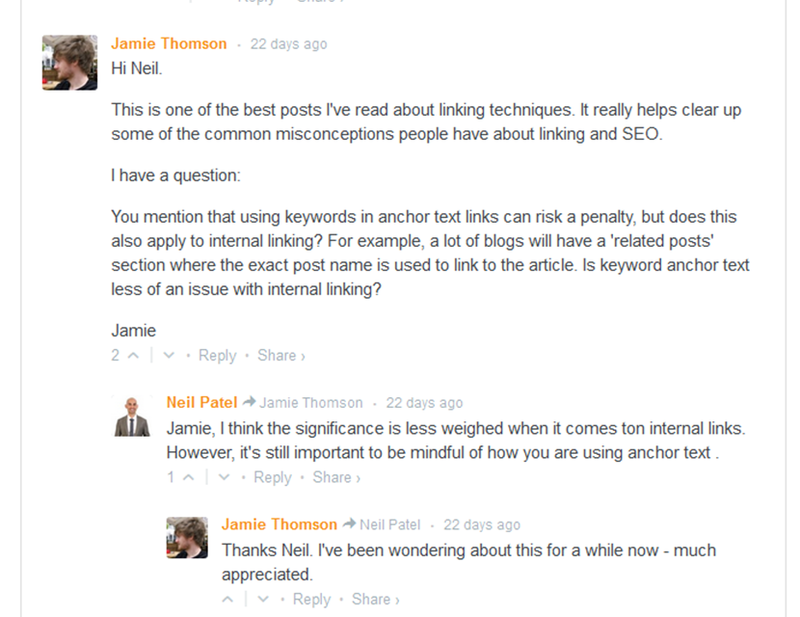 Bearing this in mind, I personally, try not to have any more than 6 internal links per 700-1000 word blog post. The structure of a web page’s URL can be an influencing factor in how crawlable a website is. URLs that contain target keywords do still generally perform better than those that don’t but they shouldn’t be manipulated to this intent. The general consensus on URL structure is that they should be easy to read by humans, and use hyphens rather than other characters to separate individual words. Research suggests that the URLs of Google’s top ranked pages contain an average of 37 characters. Adding social media buttons to your content enables people to share it quickly and easily. Google likes to see web pages that encourage social sharing on sites like Twitter, Facebook and Google Plus. Social media buttons are an essential element of an optimized web page as they encourage citations to your site, which act like votes for your content. Fascinating article, and to see how just over a year old and things have changed. Compare to https://moz.com/blog/10-things-do-not-affect-rankings and it seems there a plenty of things now not directly related to SEO. Thanks for your comment Damien. Yeah, I should probably include a caveat at the start of the post explaining that it’s now a year old and SEO best practices have evolved somewhat since it was published.